Add a touch of holiday cheer to your decor for years to come with this charming Little Drummer Long Hair Chihuahua Christmas Ornament. The perfect stocking stuffer for everyone on your nice list, this adorable Ornament stands approximately 3-3.5 inches tall and is made to last out of durable Stone Resin. 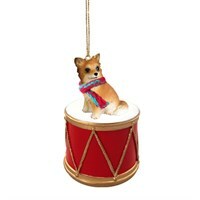 Hand Painted by skilled artisans with a fine eye for detail, friends and family will simply love receiving this Little Drummer Long Hair Chihuahua Christmas Ornament as a thoughtful gift from you this hoiday season.